We can quickly fix software and hardware issues on your work or home laptops, and provide laptop replacements should downtime occur. Laptops offer the same performance as desktop machines with the added benefit of portability, allowing you to work and stay social on the go. As these advanced systems are smaller and often leave our offices and homes, they can be at extra risk of damage. Our fully trained team of professionals are qualified to diagnose your laptop repairs and carry out fixes on a range of models, either with an on site visit or through our drop in clinic at our Horsham office. Through our years of experience, we’re able to offer a comprehensive laptop repair service to get you back in business even when the issue may seem challenging. We can help with all leading manufacturers including HP, Dell, Lenovo, Compaq, Sony and Mac, working on both Windows and Apple operating software. Should you need a temporary machine while yours is being fixed, we can arrange this so you stay connected and productive at all times. 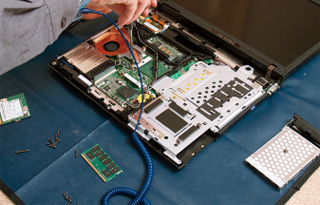 We aim to repair your laptop as fast as possible, whilst delivering an efficient and cost effective service. All of our work is charged at a standard hourly rate and once we quote, you’re under no obligation to proceed. Please get in touch for more information on our laptop repair services throughout Sussex and Surrey by calling us on 01403 290 321 or 01293 912 321.